Becoming a more effective speaker with authenticity and authority. Becoming a more effective speaker with authenticity and authority. Wait What Really OK Podcast Episode 62 hosted by Brand Precision Marketing Strategist and Counselor, Loren Weisman discusses a few simple tips and applications to apply to your speaking engagements. While there are many so-called speaking coaches and groups that help to make you a better speaker, many of them only help to create a contrived and templated style of public presentation. In this world of anyone can become a ... See More speaker, it misses out the authority and validity on what can be spoken on. The first step before anything else is to have the knowledge, experience, and authority on a topic to deliver it. This is rooted in the right information and not tone, hand gestures or audience engagement. This also contradicts the statement that anyone can be a speaker because if you don’t have a strong message, experience, and knowledge in a given subject, you don’t need to be speaking on that topic. If you have the knowledge, authority, and expertise to speak, then organizing the message, your brand, and your presentations can make all the difference in getting hired and hired again. Have the knowledge, authority and expertise to speak, then this episode is for you. If you lack those three pieces, then get those elements in place before trying to present what you don’t have yet. 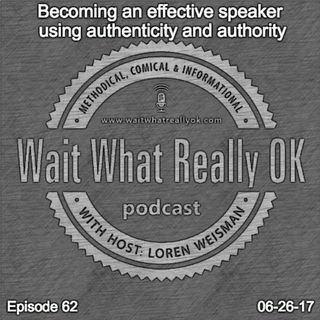 Ep 62 “Becoming a more effective speaker with authenticity and authority.” of the Wait What Really OK Podcast is available on iHeartRadio. Podcast Blog Supplement for Episode 62 of the Wait What Really OK Podcast with Loren Weisman. Podcast Link Supplement for Episode 62 of the Wait What Really OK Podcast with Loren Weisman. All presence and no substance keep speakers lacking in relevance. Podcast Video Supplement for Episode 62 of the Wait What Really OK Podcast with Loren Weisman. Podcast Photo Supplement for Episode 62 of the Wait What Really OK Podcast with Loren Weisman.